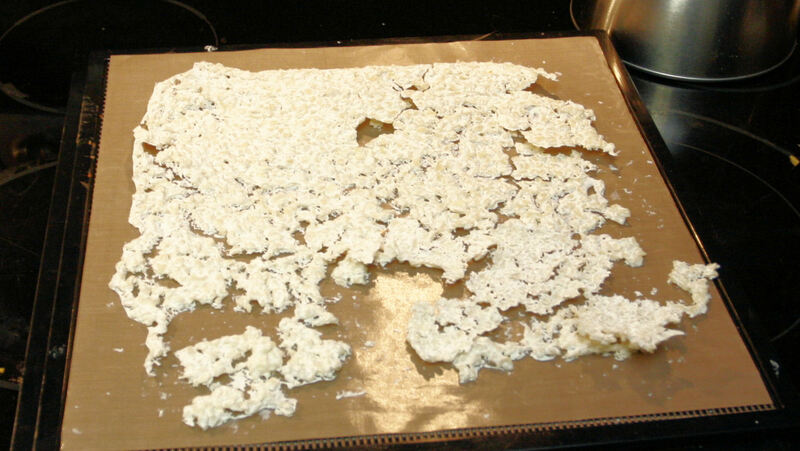 Dehydrated Cottage Cheese? Indeed You CAN! Conventional ‘food wisdom’ (ie the food police known as the USDA and FDA) ‘says’ you can’t dehydrate cottage cheese. Well, yes you CAN!! 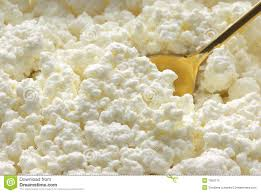 Get your cottage cheese from the local store. Any type will do but the no fat works best for fast dehydration. 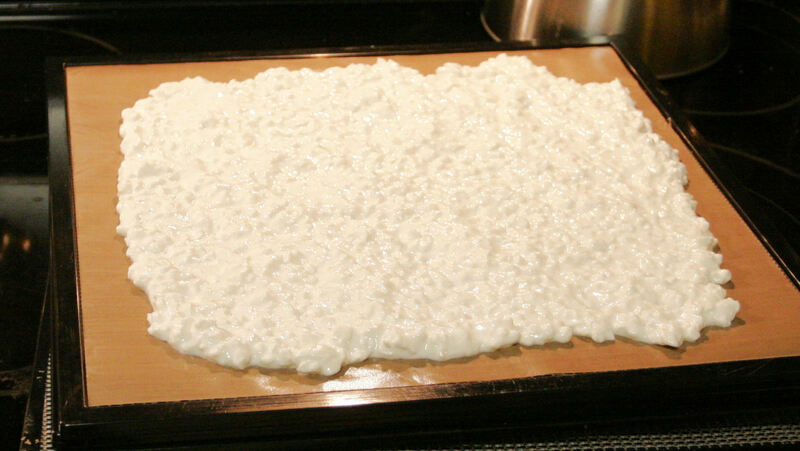 Fat included cottage cheese takes longer to dry and you will have to turn it over to complete the drying process. Non-fat dries rather quickly. Spread on fruit leather sheets as thinly as possible. Mine is spread to about ¼ inch thick. Put the dehydrator on 125 and walk away for about 8 to 12 hrs before checking. You may need to turn it. I did not have to do so since I used no fat cottage cheese. When dry (and time will depend upon your dehydrator and weather conditions) allow to sit and cool for about an hour. Vacuum seal or put into jars with O2 absorbers. Will last AT LEAST one year if not longer depending upon storage conditions. 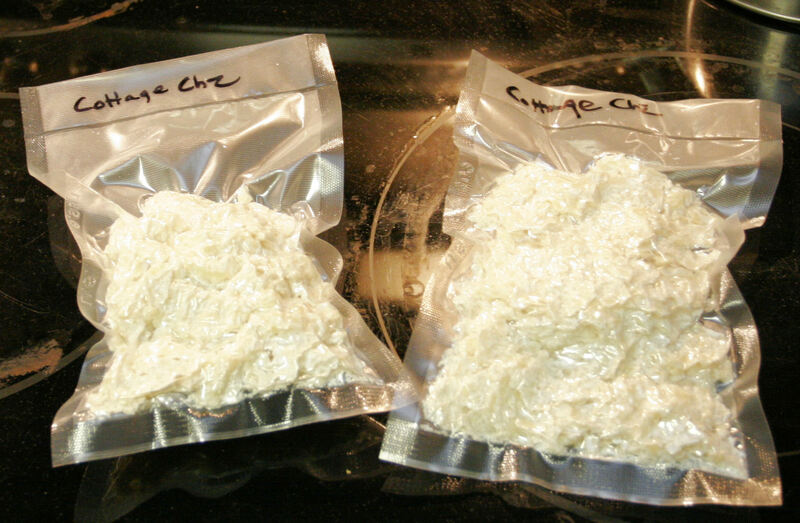 To rehydrate: pour about twice as much boiling water (by volume) to dehydrated cottage cheese and let it sit. Stir every two or three minutes for about 15 minutes. Trick is the longer you let it ‘sit’ re-hydrating the more like ‘real’ or ‘fresh’ cottage cheese it will be. It can be eaten this way or used in cooking. I have not at this point in time dehydrated this but I have eaten it (chewed) dehydrated and I will tell you…YUM! So go ahead and give it a try, it might be a treat on the trail or something good for future use. It will store well and is very cost effective. « Essential Oils…Are the more expensive ones the ‘best’?